An honest farmer, Antonio had nothing to hide from the police, so he opened the door. It was a fatal mistake. Seven young men from a street gang burst into the room. Antonio was shot and killed outright. Paula, shot in the stomach and ankle, collapsed in agony on the floor. Maria climbed out a bedroom window and escaped in the darkness to her sister Mariana’s house. Later that night Paula was transported to the emergency room where doctors treated her stomach wound. She lay in Emergency for 30 days, plus 21 more days in a crowded hospital corridor. 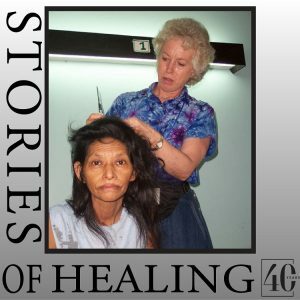 Then a Mercy Ships Orthopedic team visited Honduras in 2003. They would repair Paula’s ankle. Crewmember Helen was visiting Paula’s bedside when she complained the open sore on her back hurt whenever she moved. Helen called the team nurse who examined the sore and discovered a bullet just below the surface! The Mercy Ship anaesthetist and Orthopedic team leader extracted a .38 calibre bullet. Paula kept it as a souvenir. One day shortly after Paula asked Helen to cut her hair, which had received very little attention during her 51 days in bed. Helen had been her family’s barber for over 50 years. A time for Paula’s glamour haircut was arranged. Barbering a patient with two bullet wounds and lying in a hospital bed posed some new challenges. 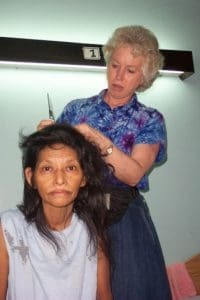 Paula sat up while Helen cut out the matted tangles, then carefully combed out Paula’s long, black, unkempt hair. After Paula lay down again on her stomach with her head hanging over the end of the bed, her daughter Mariana and Helen washed her hair. They used several basins with multiple trips carrying water from a small sink. Finally, with Paula sitting up again and following Helen’s customary prayer, the haircut began. After Helen created an attractive fringe on Paula’s forehead, I teased her that when we were done she would look like a teenager again. Paula is 54 and when she smiles you can see that all her front teeth are either missing or just rotted stubs. 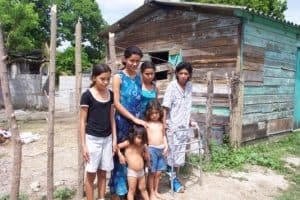 We then found out that the 5,000 Lempira ($294 USD) the gang members stole that fateful night was set aside for two things: Antonio dreamed of owning a cow, and Paula hoped to get her teeth fixed. The haircut was finished, the floor swept. Since the only mirror was over the small sink attached to the wall, Paula got out of bed, and refusing any help, she hopped on her one good leg to the mirror. We all held our breath, and then. . . Paula smiled. A few days later, our Mercy Ships van pulled off the main road into Choloma. We were looking for a small green coloured house. After a couple of wrong turns, then a left at a building spray-painted with gang graffiti, we found her daughter’s house. The hospital provided a bodyguard when we travelled on medically related visits, and now, armed with a shotgun, he took up his position nearby. We entered a small one-room house that seemed to be home for seven people and an unknown number of termites. Paula seemed a little bewildered as she took it all in. She sat up and looked at her daughter Mariana for reassurance. And then, once again . . . Paula smiled.